The Weill Cornell Brain and Spine Center is a national leader in clinical trials and research studies for neurosurgical conditions. These initiatives help achieve our mission of bringing our patients groundbreaking approaches to improving their diagnosis and treatment. Or review the complete list of our exciting clinical trials and studies (below). This study has been designed as a single-blinded, multi-center, randomized clinical trial at New York Presbyterian Hospital Columbia and New York Presbyterian Hospital Cornell. The study population includes all adult craniotomies performed at each institution over a 4 year and 9 month time period. The treatment variable is the application of topical vancomycin to the surgical site. 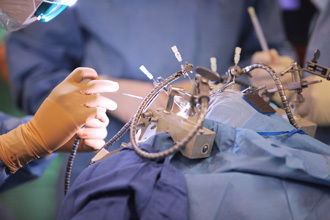 If a craniotomy is performed, a paste made from vancomycin powder and sterile solution will be applied to the edges and outer surface of the craniotomy. There are many patients with Idiopathic Intracranial Hypertension (IIH), also known as pseudotumor cerebri, who do not respond to available treatments or experience medication-related side effects that affect their quality of life. A new clinical trial aims to evaluate the safety and efficacy of venous sinus stenting in patients with refractory IIH and significant venous sinus stenosis. The Wingspan Stent System with the gateway tm PTA balloon catheter is intended for use in improving cerebral artery lumen diameter in patients with intracranial atherosclerotic disease refractory to medical therapy, in intracranial arteries with greater than or equal to 50% stenosis.